Two contrasting headlines about recent climate in the U.S. this spring caught my attention. Both came from NOAA’s National Centers for Environmental Information. 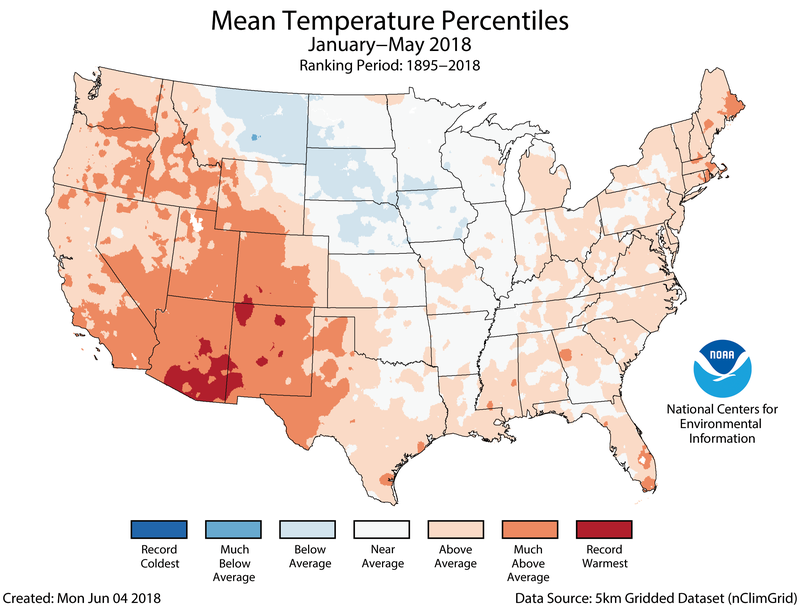 The headlines were from the assessments of climate in the U.S. for April and May of 2018. • The contiguous United States had its coldest April in more than 20 years. • The contiguous United States had its warmest May on record. The part of the U.S. where you live might not have seemed unusual. However, we noticed these differences in the midwest. Before examining April and May specifically, we will look at the climate for the year-to-date in the next two graphics. Relative to the period from 1895-2018, the upper plains was below average in temperature for the first five months of the year. The west was above to much above normal with record setting temperatures in the southwest. Not shown in the graphic, the Alaska year-to-date temperature was 20.7°F, or 4.9°F above average. It was the ninth warmest on record. Western and northern Alaska were much above normal. 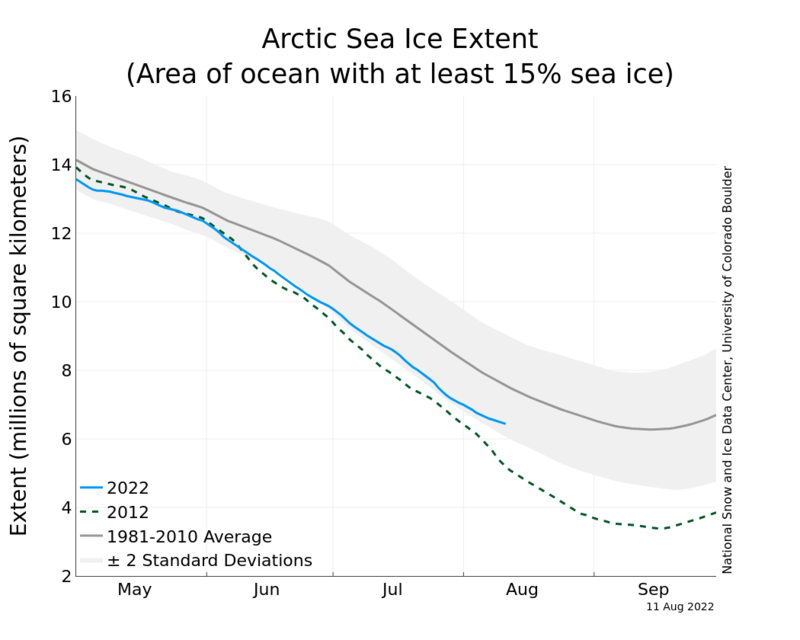 Record low amounts of sea ice in the Arctic likely contributed to the warming. A story on 16 Dec 2016 from the NASA Earth Observatory site said the Antarctic and Arctic sea ice amounts for November 2016 were both at record lows for that month. The Arctic is in the process of refreezing the surface sea ice as it goes into the winter months. 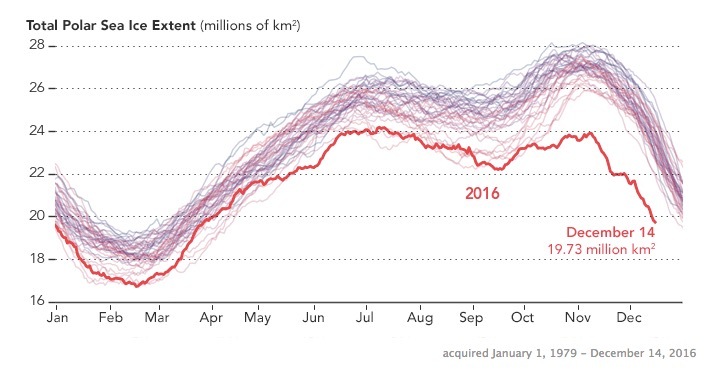 The Antarctic is in the process of melting the sea ice as it goes into the summer months. A chart from the story shows the total amount of sea ice north and south from 1 Jan 1979 to 14 Dec 2016. There has been gradual decline in the total. For 2016, the total is significantly less for the last months of the year. An animated version of this chart is in the linked article. Sea ice forms from water already in the oceans. Changes to the total does not alter sea level. Melting of land based ice drains into the oceans and does raise sea level. The decrease in total sea ice is due to shifting winds and warmer temperatures of the water. The underlying reasons and prognosis for future effects is an area of intense scientific study. The Arctic and Antarctic regions have reached their respective 2016 maximum and minimum polar ice extents. See the blue graph lines. The Arctic winter ice maximum extent was the smallest on record. The Antarctic summer ice minimum was slightly less than the recent 30 year average. Climate Encyclical | Will It Move Us To Act? 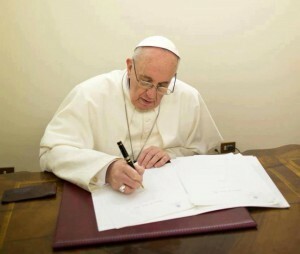 There was much anticipation about the recent encyclical from Pope Francis on climate change. You can see and read the document at this link. No doubt you have seen and heard the news about it with some analysis of what is contained in it. I offer my impressions of the broad picture described in the 184 page document. I’ve written a lot about climate change. It is one of the most important challenges faced by mankind. It will force us to deal with issues we already know about and some that we have yet to encounter. It will not go away if we ignore it. Whether the encyclical is accepted by the world of Catholic leaders and followers will only be known by our actions in the future. There was a flurry of attention for a few days. Like many stories today, the attention has faded. I hope its messages are not forgotten. Each chapter of the encyclical addresses aspects of the climate change problem I feel are very important. The document does not lay out a prescription for what humanity should do. It does serve as a reminder of our responsibilities to the Earth and to those less fortunate who do not have the means to help themselves easily. We all need reminders and guidance in those areas. Remember the record snowfall this winter in Boston and surroundings? It seemed endless. The record total for Boston was 108.6 inches. This image is from early February. This map from NOAA shows liquid precipitation over the region for the recent 180 days since late November 2014. There are widespread locations with 20 inches. One in yellow near Boston had over 25 inches. NASA’s Operation IceBridge images Earth’s polar ice in unprecedented detail to better understand processes that connect the polar regions with the global climate system. IceBridge utilizes a highly specialized fleet of research aircraft and the most sophisticated suite of innovative science instruments ever assembled to characterize annual changes in thickness of sea ice, glaciers, and ice sheets. Now in the seventh year, IceBridge is deep into the Arctic research campaign. Each year, the aircraft fly over the Arctic or the Antarctic to gather data on the ice and how it is responding to climate change. The data is related to that of other research efforts such as ice core drilling and satellite observations. One of the regions intensely studied is Greenland which is 85% covered by ice to up to an average depth of 2.3 km (1.6 miles). The great weight of the ice has pressed the central rock layers of Greenland down 300 m (1000 ft) below sea level. There is enough ice on Greenland to raise sea level by 7 m (23 ft) if it were to all melt. Knowing the structure and past history during previous climate eras will help understand the prospects for future behavior. To that end, IceBridge researchers released this 3-D visualization animation of the ice layers. It was produced by the NASA Goddard Scientific Visualization Studio. Run time is 3 min 37 sec. I enjoy reading the blog by Dr. Jeff Masters at Weather Underground. In a recent post, Bob Henson said that atmospheric CO2 had reached a new high value. His supportive evidence linked to the Keeling Curve data maintained at Mauna Loa in Hawaii by the Scripps Institution of Oceanography. Each day you visit the Keeling Curve page, the most recent CO2 value is posted above the charts. The images in this gallery were each obtained by hovering my mouse pointer over the time spans below the chart. As you go through the gallery, notice the cyclical pattern evident in the 1 yr, 2 yr, and 1958-to-Now images. Also note the rapidly increasing trend toward higher CO2 levels in the 1700-to-Now image. The impact we humans have had on the levels through fossil fuel use during this era is quite apparent. The final image includes a huge span of time inclusive of several global warming and cooling episodes. None of those episodes had levels of CO2 near those of today.